Formalin fixed, paraffin embedded human breast cancer biopsy stained with Mouse anti Human cytokeratin 19 antibody (MCA2145) followed by HRP polymer detection and DAB substrate development following heat mediated antigen retrieval using citrate buffer at pH6.2 (low power). Formalin fixed, paraffin embedded human breast cancer biopsy stained with Mouse anti Human cytokeratin 19 antibody (MCA2145) followed by HRP polymer detection and DAB substrate development following heat mediated antigen retrieval using citrate buffer at pH6.2 (high power). Sandwich ELISA analysis of human cytokeratin-19 expression using Mouse anti Human cytokeratin 19 antibody, clone BA19 (MCA2145) as a capture reagent and biotinylated Mouse anti Human cytokeratin 19 antibody, clone A53-B/A2 (5552-9009) as a detection reagent with purified human cytokeratin 19 (Bio-rad catalog; 34002301) as antigen to create the standard curve. Detection is by HRP conjugated streptavidin and substrate. Microtitre plate is read at O.D. 450 nm on the Bio-Rad iMark Microplate Absorbance Reader (Bio-Rad Catalog 168-1135). Normal serum (green), colorectal cancer serum (orange) and breast cancer serum (red) samples at 1:4 dilution are shown. Mouse anti Human Cytokeratin 19 antibody, clone BA17 recognizes the ~40 kDa cytokeratin corresponding to cytokeratin 19. 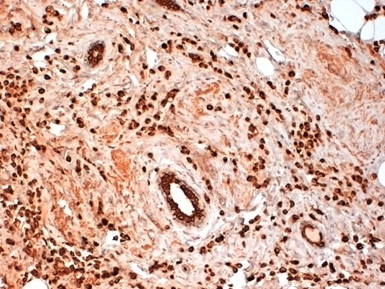 Cytokeratin 19 is expressed by many simple and non-keratinizing normal and neoplastic epithelia, including glandular and ductal epithelia. Bartek, J. et al. (1985) A subclass of luminal epithelial cells in the human mammary gland, defined by antibodies to cytokeratins. J Cell Sci. 75: 17-33. Bartek, J. et al. 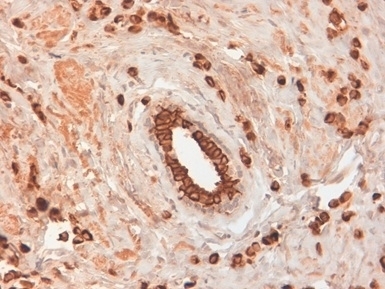 (1985) Patterns of expression of keratin 19 as detected with monoclonal antibodies in human breast tissues and tumours. Int J Cancer. 36 (3): 299-306. Chen, Y.K. et al. (2006) Ductular proliferation in liver tissues with severe chronic hepatitis B: an immunohistochemical study. World J Gastroenterol. 12: 1443-6.